Night is just leaving the sky as I wait in the shadows, outside the colonnade. her this fabulous opportunity.) So early one Wednesday morning in September, I made my way before dawn to Piazza San Pietro and stood in mob for 90 minutes, from 06:30 to 08:00, to gain entrance and get a good seat. 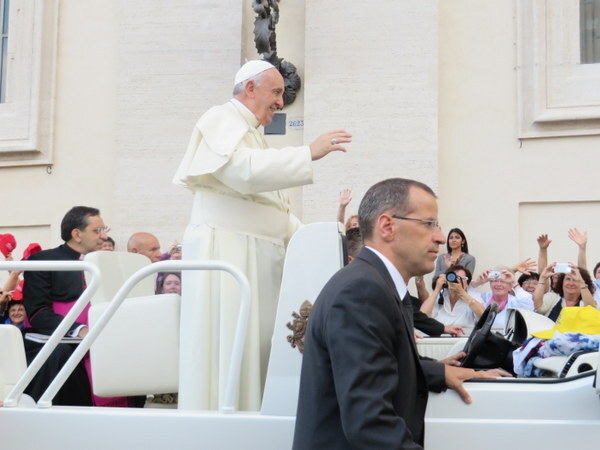 Luckily we were blessed with a perfect autumn day and our early arrival meant seats right against the fence along the path Papa Francesco would take in his pope-mobile. 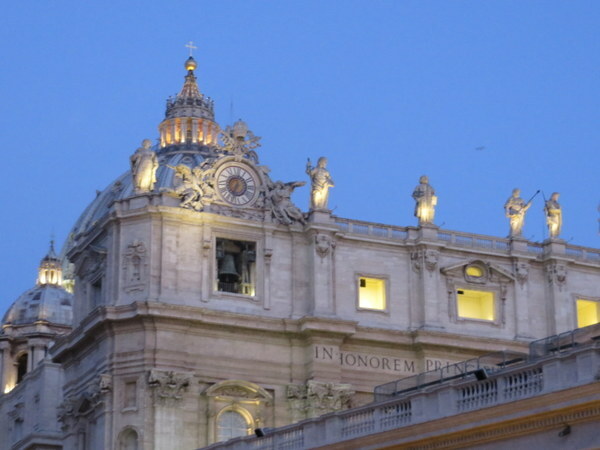 The first rays of sun hit St. Peter’s Basilica shortly after we are admitted. Before dawn the Roman Metro is amazingly busy as working folks head to the places they maintain for our use during the working day. And never before have I taken the first bus out of our neighborhood at dark and lonely 05:30. Then the long walk to the piazza, around to the south side, past vendors of trinkets one can have blessed by his Holiness. Rosaries, medallions, pictures, crosses, all available from probably-not-Catholic vendors from Pakistan. 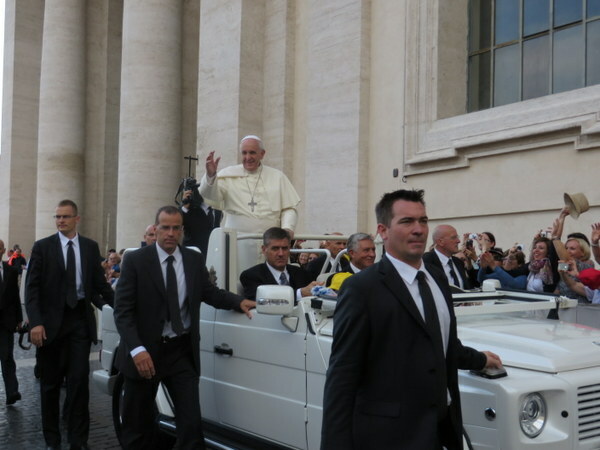 There was a lot of waiting before the crowd began to murmur and there were glimpses of the great man riding through the square in his white open-top converted something-or-other. (Is it a Jeep?) 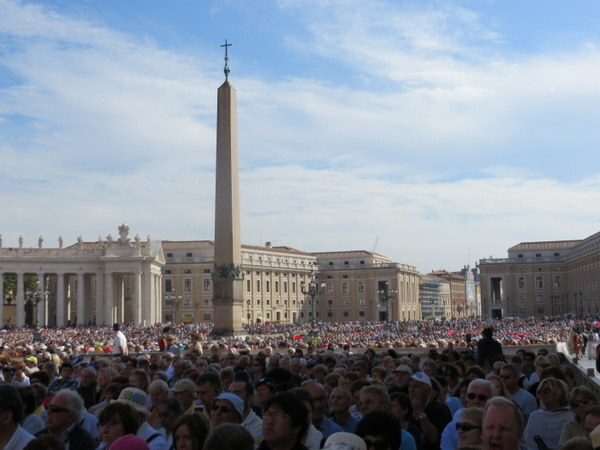 The audience is supposed to being at 10:30, but this pope is known for starting early, at 10:00. Shortly before 10:00 he passed our forward position. I tell you the man radiates charm and goodwill! The audience is conducted in seven languages: Italian, French, German, English, Polish, Spanish and Arabic. 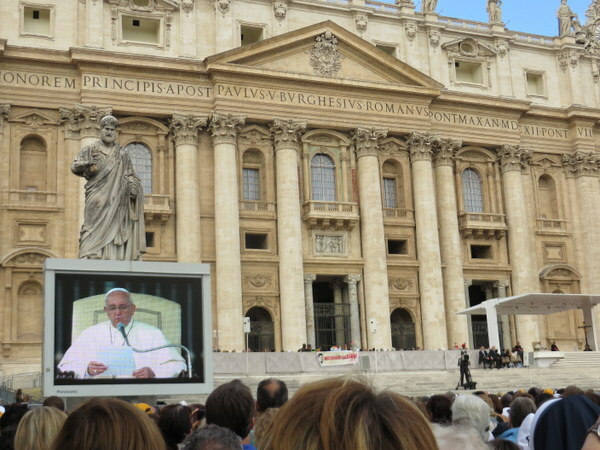 The Pope gives a homily in Italian, this is then paraphrased in each language. Special greetings are offered to pilgrimage groups in their languages, again repeated in each of the other languages. As each language is spoken the receptive native speakers cheer. I was perplexed by the inclusion of Arabic. I have to say that after the Arabic portion, I did not hear any resounding cheers from an Arabic component. I have to wonder if he includes Arabic every week, or if it is included currently as a demonstration that there are Arabic-speaking Christians, too, a counter-point to the ISIS threat against the Catholic Church. I was “this close” as he rode by. I’ve heard he gives his handlers heart failure as he is so difficult to guard. His openness is delightful. So about those Marines. These are four women who served our country a total of 120 years-or-so. 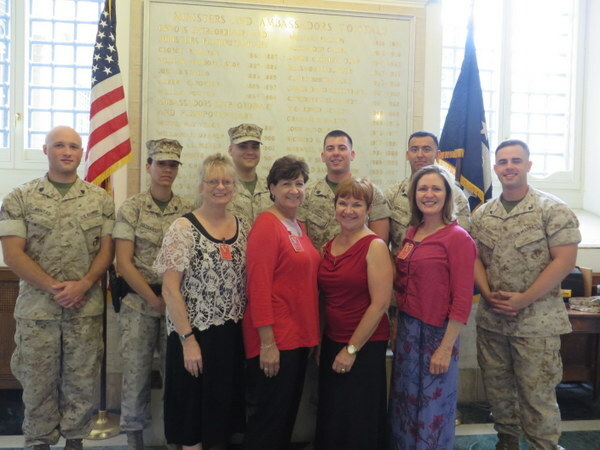 I had the privilege of hanging out with them for a day and a dinner, giving a tour of the Embassy and also introducing them to our fine Marine Security Guard. 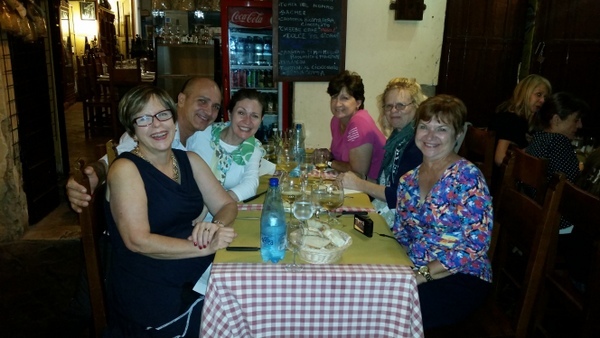 They spent a couple of weeks touring Italy from North to South, wrapping up here in the Eternal City. They certainly made my week more interesting! With a gazillion people in the audience, Jumbotrons are essential. The audience reaches back to the far end of the piazza. We are in the front 20% or so, thanks to the Bishop of Las Vegas. 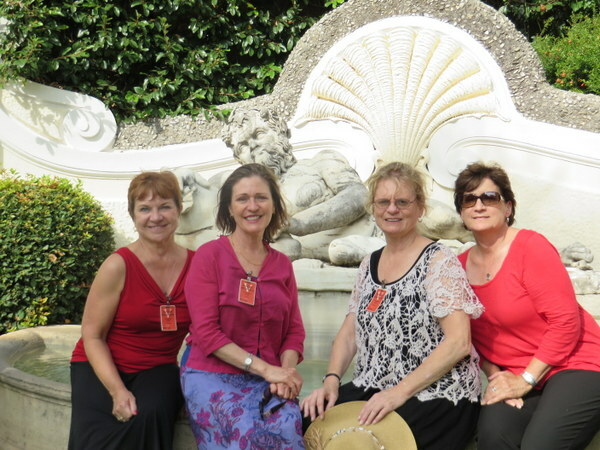 Holly, Victoria, Mary Ellen and Patricia, great new friends! 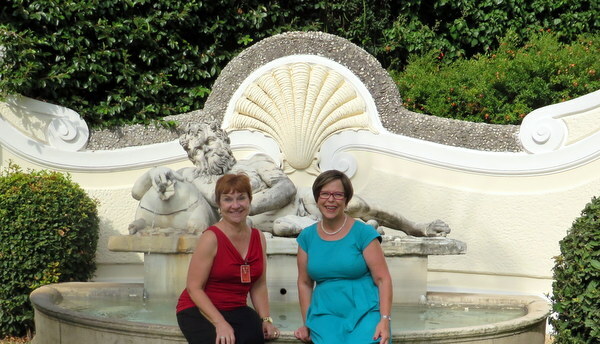 Holly and me by the Reclining Silenus, a Roman Imperial era statue on the embassy grounds. Hi Laurel! Great timing for this post! We’ll be in Roma on the square on the 29th. I was shooting for 7:30, but you’ve confirmed my fear that this might not be early enough. 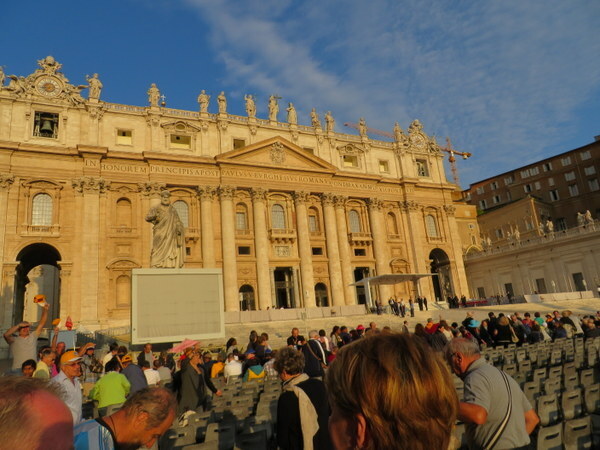 I went to my first audience inside the Basilica in 1970 with my semester abroad contingent, and it made quite an impression on this Methodist. We’ll TRY for 6:30! Hi Ruth. If you have tickets for the seats up front. 7:30 is early enough unless A) your group is large, or B) you “need” to be along the pathway the Pope travels on his way in. Even at 8:30 there were still seats in the reserved section, but central seating, not along the pathway. I love the Jombotrons! When we took my son and daughter-in-law to an Audience in 2000, they did not have them. And it would have helped! I loved seeing the delegations from all over the world. An African delegation sat right behind us, and broke into one of their songs – along with drugs and other instruments – when they were recognized. I remember thinking how joyful they were. So glad you went – and you got to see a Pope that may be one of the great ones. Happy Travels to Oregon. Alas, we have given up rain, but are still beautiful. I thought this was so interesting so I’m sending it along. Hi Laurel. You’re timing for this post was perfect … to get us in the mood for our trip! We depart this afternoon for Bologna … an apartment through Airbnb … then to Venice next week for the return to Ft Lauderdale. Enjoy your vacation home to the US!